It was at this time that I also ran into my first “we’re speaking the same language and yet…” issue. A couple days prior, Katia had purchased a Mega Rider pass for the Cambridge buses, which allowed unlimited on-off for a week. She advised me to buy the same pass, which would last me until my departure. It would greatly reduce my cost to and from the train station as well as the need to dig for change every time I got on the bus. Katia boarded ahead of me, flashed her pass and headed up to the upper deck for seats. I asked the driver for a “Mega Rider pass” (saying “pahss” as I’d already ended up with a terrible hybrid accent). He repeated “pass” (or so I thought) and I nodded. He asked for £22.50, which was more than Katia said hers cost, but I wasn’t going to argue with the driver. I handed over the money, he printed the pass and I headed up to join my friend. She glanced at my pass and saw that it said “Mega Rider Plus.” After looking that up on her phone, she realized that it was a deluxe pass good for more than just Cambridge buses (which I didn’t need). However, when we exited the bus at the train station and tried to explain my mistake to the driver, he wasn’t having it. Apparently, when I said “pahss,” he heard “plus” and confirmed “plus” with me, which I heard as “pass.” “What we have here is failure to communicate,” indeed! Bus pass snafu aside, Katia put me on the 0950 train to Kings Cross and headed back home to work. I got lucky that this train to Kings Cross only stopped twice (it really does pay to look at the sign of stops before boarding the train; the train leaving next may not be the fast train to your location!) and I felt very grown up and non-tourist-y as I muscled my way from Kings Cross to the Underground. I needed to take the Circle line to Tower Hill for my first activity of the day – the Tower of London. However, once I wound my way through the maze of tunnels to the Circle Line platform, I heard the announcement that the Circle Line was suspended until further notice and the District line (the only other Tube line that goes through Tower Hill station) had severe delays. I sighed, pulled out my trusty Moleskine and set to work figuring out how to get to the Tower of London. I wasn’t alone in this endeavor as there were at least two different groups of French teenagers attempting to do the same. Also boarding at this platform was the Metropolitan line, so I jumped on the next one that came through. I was happy to get a seat and a European woman sat down next to me. She needed to get to the Tower Gateway DLR station (which is just across the street from the Tower Hill Underground station) to go to Greenwich and asked me how to do so. Lucky for her, I was doing this exact thing the next day, so I was able to explain to her that we’d take the Metropolitan line to Aldgate and walk the few blocks south to Tower Hill/Tower Gateway, where she could take the DLR to Greenwich. This would not be the last time that someone would ask me for directions to get somewhere, but it was definitely a shock as this was my first proper day in London and I’d been in town for about 10 minutes! I guess I just have the look of someone who knows where they are going! However, luck was not on our side as no sooner was the subway moving than the conductor announced that this train would be stopping at Moorgate, not continuing on to Aldgate, so we should get off at the next stop and wait for the next Metropolitan line train. (Not sure why we needed to alight at Farringdon instead of continuing to Moorgate to wait for a train to Aldgate, but whatever). I got off at Farringdon, but my European companion did not. I felt slightly guilty at leaving her there, but well, I was already running behind on my proposed timetable. A few minutes later, I got the next Metropolitan line train and headed to Aldgate. 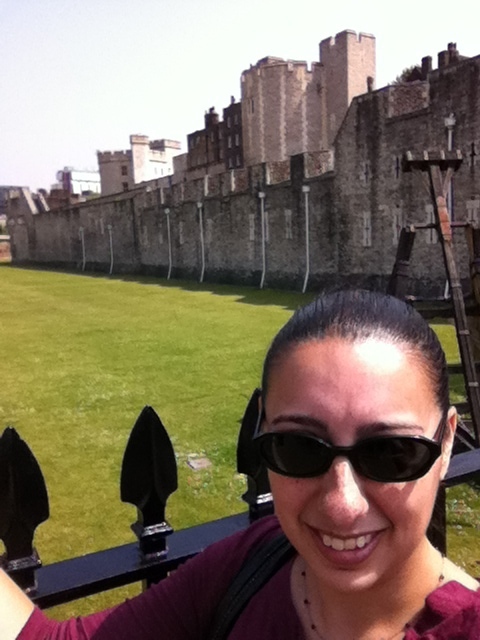 Having successfully navigated the subways in DC, San Francisco, and Manhattan, I felt confident in my ability to exit the Underground station and walk down to the Tower of London. One thing I was not expecting? London streets don’t have street signs! I could go right or left and I chose left. I walked a couple blocks before deciding that it didn’t seem right and went back the other direction. If I’d been paying attention to the sign in front of me when I exited instead of my notebook, I’d have seen the sign pointing to the right for the Tower of London. From there, I quickly found my way down to the Tower of London and picked up my pre-paid ticket. Instead of arriving about 10:30, it was almost noon when I walked through the gates. 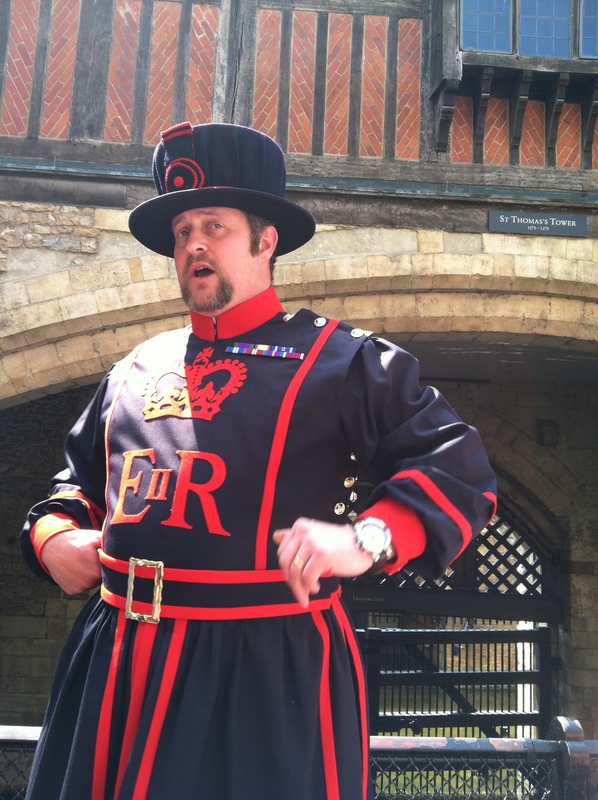 While I was disappointed at my late start, I was overjoyed to meet Chris, the Yeoman Warder guide for the 1200 tour of the Tower. He was funny and informative, my two requirements for a tour guide. “Do we have any Americans here?” [several of us raise hands] “Well, I apologize, but I will be speaking ENGLISH on this tour.” The Tower of London was one of the few places I thought I had visited during my 1995 trip to London. 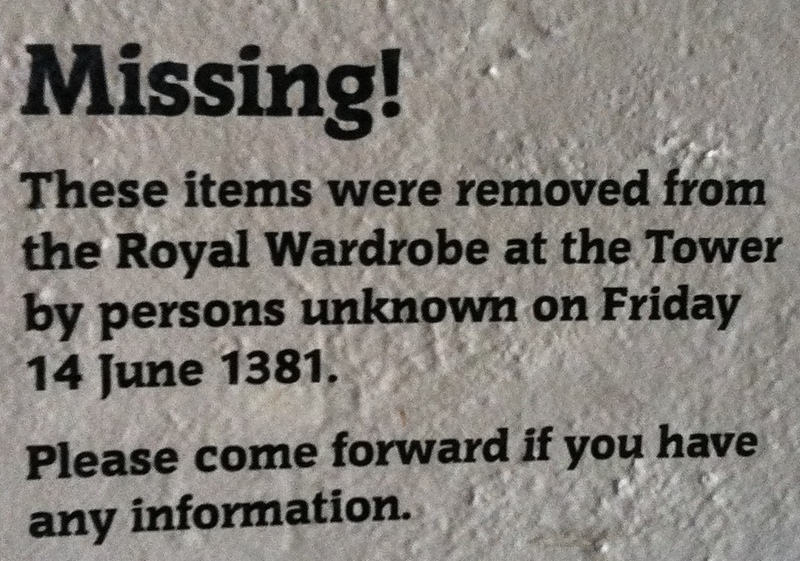 Well, I definitely had NOT (don’t know where a costumed guide talked to us about torture in the Tower, but it wasn’t here!) and I’m SO glad I went. The guided tour portion was amazing, especially the end. The last part of the tour takes place inside the Chapel Royal of St. Peter ad Vincula (no photos allowed inside) and is the final resting place for those executed at the Tower, including Anne Boleyn, Catherine Howard and Lady Jane Grey. Previously, we’d been shown the house/cell where Anne Boleyn had been held and the monument on the place where the scaffold stood for her execution. It was overwhelming and surreal to be present in that place, a feeling that would be common for me as I continued my tour of London, coming face-to-face with people and places I’d only read about in books for so long. 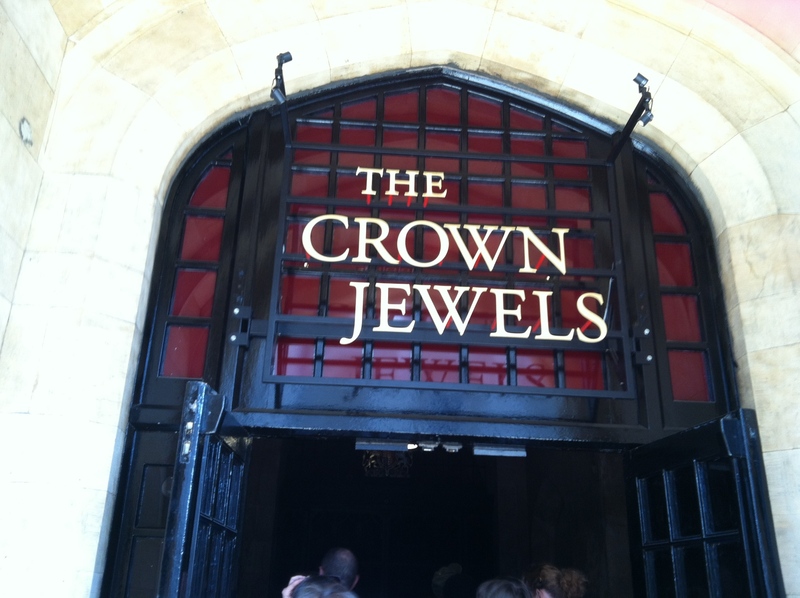 Following the guided tour, I noticed there was no queue for the Crown Jewels, so I quickly made my way over to see them. A bit like Disneyland, you wander through rooms with the history of the different pieces before you get to the main attraction. I almost didn’t make it to the final room because I was enthralled with the newsreel footage of Queen Elizabeth II’s coronation. I expect this shows daily, but as it was days until the Diamond Jubilee, it had an extra special sense of occasion to watch. There were only about 40 people in the room with me when I went by the Crown Jewels, so I was disappointed that the moving walkway was turned on. I fully understand its purpose, to keep people moving when it’s unbearably crowded, but the walkway just went by too quickly. There is a raised platform from which you can view the Crown Jewels without moving, but it’s further away and doesn’t have the greatest view. I promptly bought postcards from the gift shop upon exiting, which is exactly what they wanted me to do, so well played, Tower of London! From there, I proceed to the walk along the top of the wall on the north side of the Tower, enjoying the view of the Tower Bridge and the humorous signage in each of the exhibit towers. At this point, it was almost 1400 and I was starving! I left the Tower, stopping at the main gift shop to buy more postcards and souvenirs before heading to EAT for lunch. At this point, I realized that I was not going to have time to visit the Tower Bridge after all. I was disappointed I wouldn’t get to walk across (a little terrifying, but still worth doing) or go up on top (more terrifying, given the St. Louis Arch incident of 1998, but still worth doing), but there simply wasn’t time to do it justice (especially given the £8 ticket price – about $12.50) and still make it to my next stop. Instead I enjoyed a leisurely lunch before navigating to the London Eye and Pier via Underground. 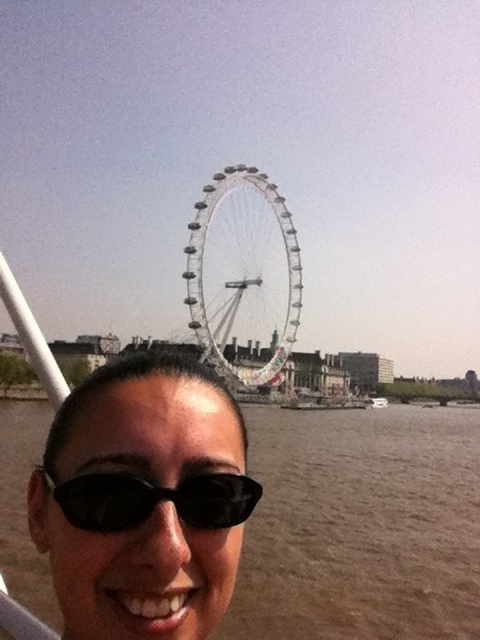 I took the District line from Tower Hill to Embankment (delays having cleared up) and walked across the Jubilee Bridge to the other bank of the Thames for my London Eye river cruise. It was close to 90°F at this point in the afternoon, so I was definitely looking forward to spending some time on the water. Our guide was not quite as funny as Chris the Yeoman Warder, but she was quite knowledgeable about all the buildings we passed. It felt a bit like the Chicago Architecture Cruise I took in 2009, which I LOVED. 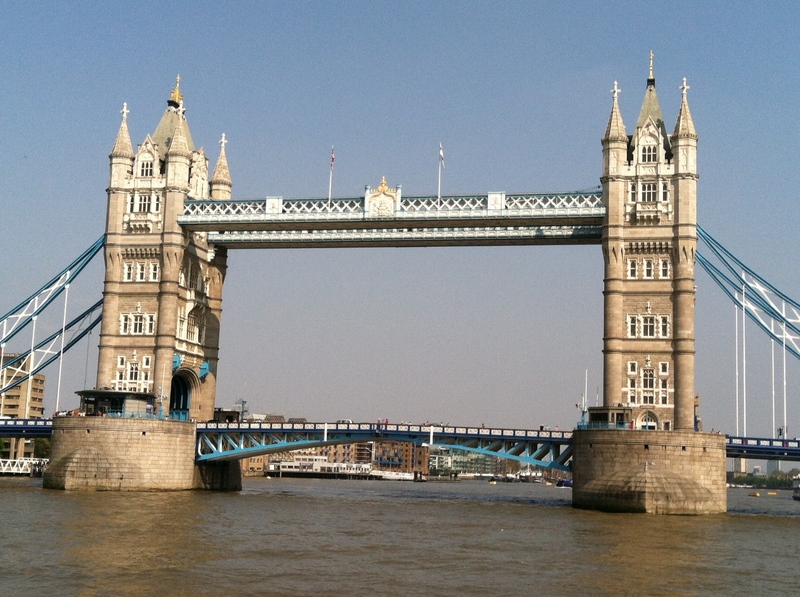 We cruised from the London Eye up the Thames, passed the Tower of London and under the Tower Bridge before turning back. Subsequently, I have about 50 photos of Parliament and the Tower Bridge (each) alone. Aside from those two attractions, I loved the old houseboats that have been converted into floating garden plots for the residents of the warehouse condos in the old wharf district. I wish San Francisco had something like that! 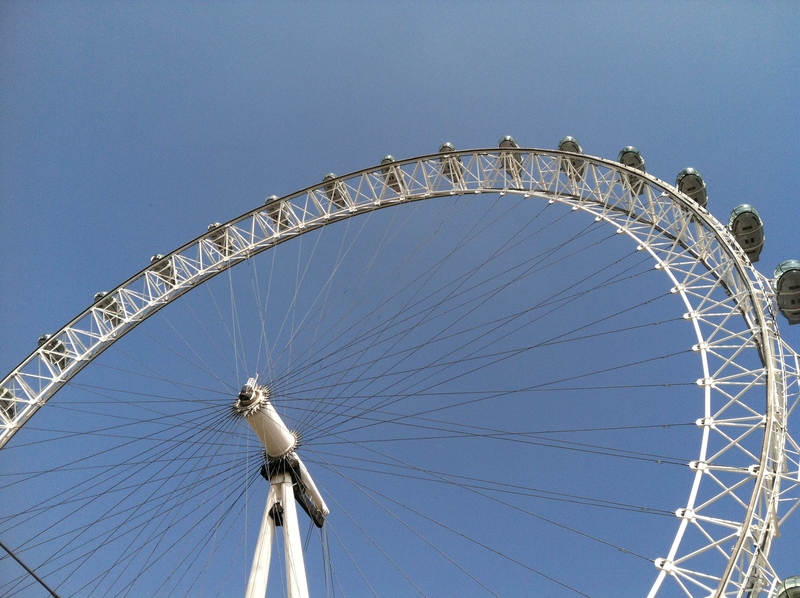 There was a short wait for my flight on the London Eye, but was totally worth it! The river cruise had done nothing to cool me down (wearing jeans and a 3/4 sleeved shirt because it was London in May and who thinks to pack shorts?! ), so I was glad for the air-conditioned capsule if nothing else. 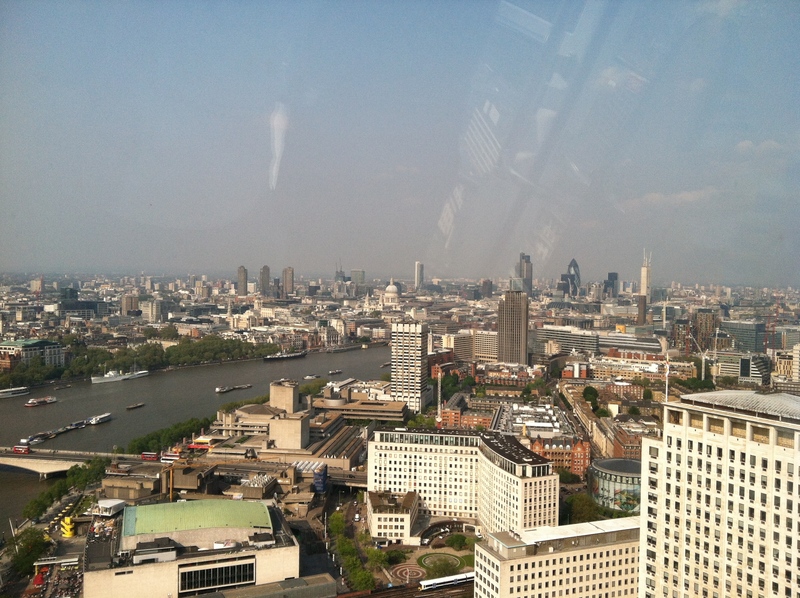 The view from the Eye was spectacular. I would have liked to have slightly fewer people inside so it was easier to move around, but everyone was courteous to each other and not a rude American in sight! I got a little touch of vertigo if I got too close to the edge of the capsule, so I don’t have the most fantastic photos, but I loved the journey. The heat made it too hazy to see all the way to Windsor, but I couldn’t have asked for a clearer day otherwise. I bought a £2 slushie as I made my way to Waterloo station to combat the heat and sweatiness I was feeling. It was nearing 1800 and Waterloo station looked like something out of an old movie. Thousands of commuters funneling into the entrance, each grabbing their free copy of the evening paper to read on the train home. As I had my empty slushie cup (and there was nary a rubbish bin to be found! ), I didn’t take a paper, but wished I could just for the experience. I took the Northern line to Leicester Square and transferred to the Picadilly line to Kings Cross. Once we got going, I finally properly understood the announcement that at our first stop, the first 8 carriages would be going on the Cambridge and the back 4 (where I was currently sitting) would be splitting off for somewhere else. At Royston, I popped off the train and hustled up to the first 8 carriages. I was so proud of myself, having successfully navigated all this public transportation during the day and I should have known that I wasn’t home free yet. I got off at Cambridge and realized that I still didn’t know how to use my ticket to exit. So, I stopped to ask the gate agent standing just outside the crush of people trying to exit via the three faregates available. Turns out, the reason my ticket didn’t work at Kings Cross was because it was an off-peak fare ticket, so I wasn’t supposed to leave Kings Cross between 1630 and 1900. The East Coast Rail employee that let me through either didn’t look closely at the ticket or didn’t care. Either way, I wasn’t supposed to be in Cambridge yet, so my ticket (which I would eventually figure out was just using the return ticket) wouldn’t work regardless. Apparently, East Coast Rail employees do this kind of thing all the time, annoying the First Capital Connect folks (which I was using). The gate agent let me out of the station with a stern warning not to try it again and I was on my way, lesson learned! I had to wait over 20 minutes for the bus to Katia’s, so I was hot, sweaty, tired and hungry by the time I darkened her doorstep. In celebration of my return to Cambridge after a day of London adventuring, she decided to take to the “Latin American” restaurant, Las Iguanas. Looking at the menu, it seemed like there was something “wrong” with each item like a chimichanga filled with “roast butternut squash, iron-rich spinach, cheese & chickpeas” or a burrito that includes coleslaw (not to mention that the coleslaw has raisins in it!). But the drinks were strong and priced right, which was exactly what I was looking for after my hot day in Londontown. Katia and I powered through the spiciest nachos I’ve ever eaten (it seemed the chips were coated with chili powder) before having better luck with our main courses (though our dear Polish waitress could not say “quesadilla” correctly). Katia had promised me an adventurous dinner and it had delivered in ways I could not have expected! It was a balmy evening in Cambridge and many of its denizens were enjoying a beverage by the river. As we walked back toward Katia’s flat, she recognized two friends from her program partaking in this Cambridge tradition and they invited us to join them. After a quick trip to the off-license to procure a beverage, we spent a couple of hours sitting by the River Cam with Ed and Tom, talking about all sorts of things, including Ed’s newfound knowledge of (and fascination with) Virginia Dare. Being from Virginia, Katia and I are well-versed in the history and mystery surrounding her birth and disappearance, but it was quite fun to discuss it with a Welshman. Around 2300, we had to depart the riverbank and head back to Katia’s flat. I slipped into bed around 0130, exhausted, but happily so.